Renowned conductor Charles Dutoit is to leave the Royal Philharmonic Orchestra almost two years earlier than scheduled following sexual assault allegations. Dutoit, the orchestra's principal conductor and artistic director, had been due to step down in October 2019. Following an emergency board meeting, however, his departure has been brought forward and he will leave immediately. 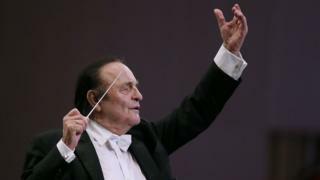 In December, three opera singers and a musician accused Dutoit of forcing himself upon them - which he denied. "Whilst Mr Dutoit continues to seek legal counsel to defend himself, the protracted uncertainty and media reporting makes Mr Dutoit's position with the orchestra untenable," the London-based orchestra said in a statement. "The RPO is committed to the highest standards of ethical behaviour and takes very seriously its responsibility to maintain a safe working environment for all its artists, musicians and staff." Dutoit has conducted in the world's major opera houses and has been nominated for 10 Grammy Awards, winning twice. He has led the RPO since 2009. Retired opera singer Paula Rasmussen claimed he accosted her in his dressing room, while another singer, Sylvia McNair, alleged he had "tried to have his way" with her in 1985. Two other accusers who asked to remain anonymous made similar allegations to the Associated Press news agency. In a statement, Dutoit said the "serious" accusations "involving coercion and forced physical contact" had "absolutely no basis in truth". He said: "The allegations made against me are as shocking to me as they are to my friends and colleagues. I do not recognise the man or the actions being described in the media." A number of other orchestras distanced themselves from the Swiss conductor when the claims surfaced.